Fivelements is a luxury eco-resort in Bali's spiritual heartland and has been providing healing and holistic experiences for guests since opening in 2010. The multi-award-winning resort is surrounded by rice fields and Ubud's tropical forests, and focuses on an integrated approach to wellness, blending modern medicine with traditional techniques. Unlike most ready-made couples’ retreats, this unique weekend getaway offers all the personalisation you require to make it a truly special event. In addition to sumptuous meals, romantic walks through the rice paddies and a special couples’ ritual, the Fivelements Wellness Team will prepare with you a wellness programme which best suits your physical and spiritual needs. 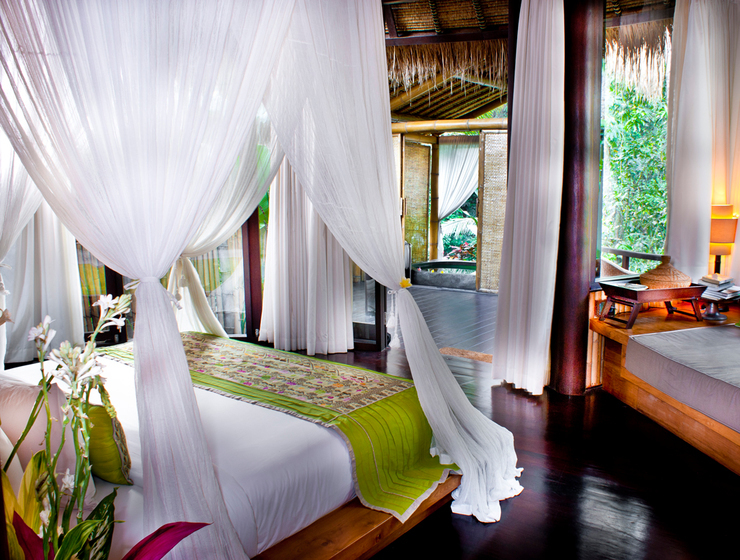 Fivelements offers a range of suites right on the banks of the Ayung River. Relax in a private pool, enjoy complimentary breakfast or sit by the balcony and admire the lush green views. Each riverside suite is housed in a private pavilion fashioned after a sacred spiral and embellished with traditional Balinese ‘Songket’ textiles and antique touches. Each has a spacious terrace overlooking Bali’s sacred Ayung River, with a healing alfresco bathhouse including chromotherapy lighting, air-conditioning, sound system with iPod dock, wifi Internet access, safety box, hairdryer and a generous array of amenities. To celebrate “aliveness,” Fivelements provides a unique cuisine of plant-based, raw vegan living foods. The exciting tastes, pure flavours, and fresh textures are complemented by the sheer beauty of these artful, colourful dishes. All dishes are made with locally sourced ingredients supporting local farmers and sustainable agriculture, and every bite is a gesture of self-care for mind, body and soul. Prices may be subject to a 21% government tax; prices may be subject to fluctuation depending on day, season and availability. Fivelements is nestled on the banks of the Ayung River. A truly unique location, this resort takes you away from the crowded beaches, and gives you a truly unique experience in the heart of Bali. The resort is 30 kilometres from the international airport, around a 75-minute drive.